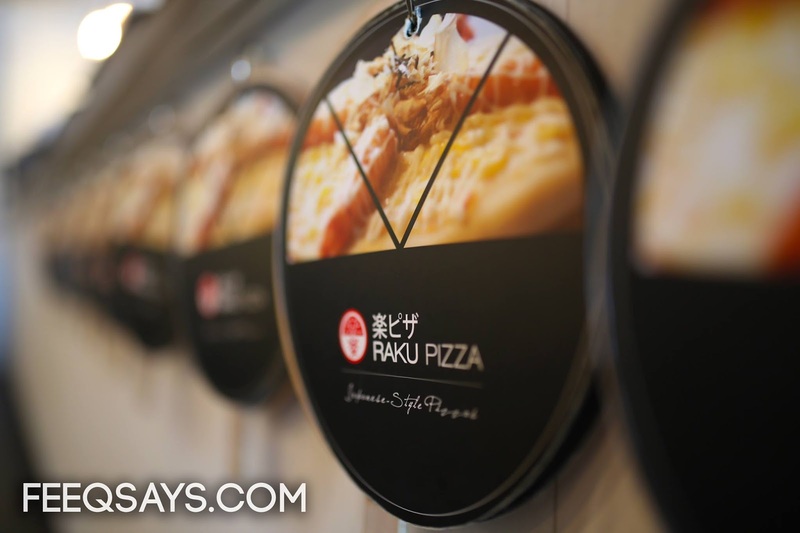 What's so different with Raku Pizza? Firstly, the whole Japanese inspired fusion pizza idea is just amazing. 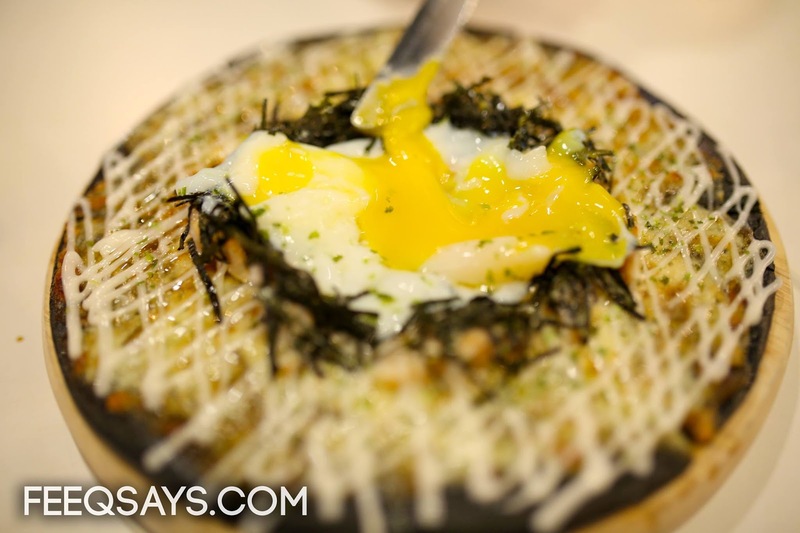 I wasn't very convinced about how seaweeds, bonito flakes, soft boiled eggs and pizza dough can go well together. The idea was very foreign and weird to me. But oh, I was so wrong. Undeniably wrong. Some of the pizzas I had that day surpassed the normal pizzas I usually love. So yeah, if someone suggested me for another round of Japenese fusion pizza there I would gladly say yes. But that's not just it, another thing that sets Raku Pizza apart is that we can actually customize our own pizza. I love cooking so I was really ecstatic by the chance to experiment on flavours and trying to match the ingredients so that my pizza won't come up as a failure to the taste bud. 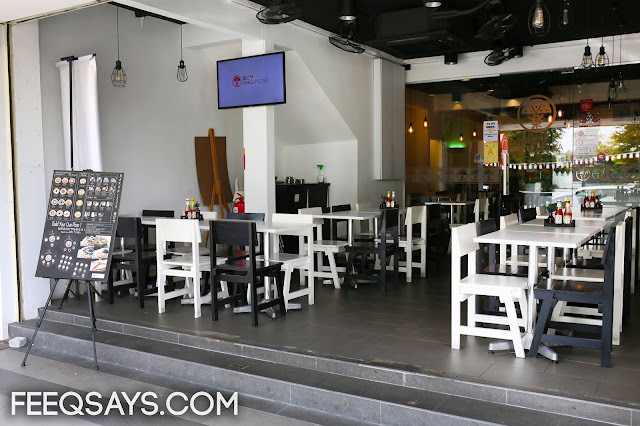 If you're not very convinced by your own skill (because we know some people are just not born as an intuitive cook) *cough*, you can always opt for the in-house recommendation, like their signature pizza Sakurajima Lava (RM12.90). Charcoal crust, teriyaki sauce, cheese, grilled chicken, sweet onions, onsen tamago (soft boiled egg), japanase mayo and shredded seaweed. Like I said, the idea of soft boiled egg on pizza was not very convincing to me at first. But to my defense, it was what I thought before I tried that heavenly taste of thinly spread soft boiled eggs (spread it yourself!) on the thin crusted pizza. 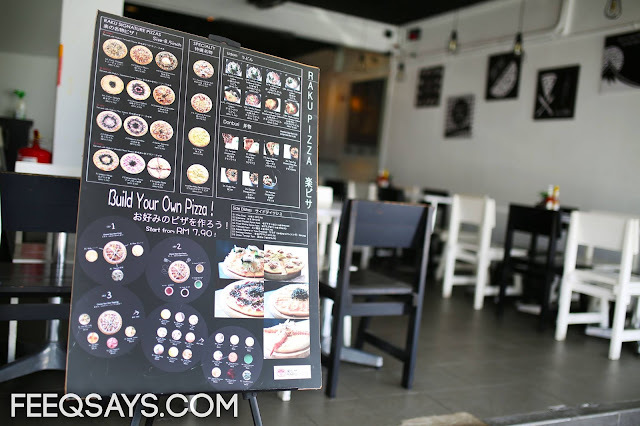 If you're too lazy to DIY your pizza, this pre-customized pizza is definitely my recommendation. It's really good that one of us ordered for a second! 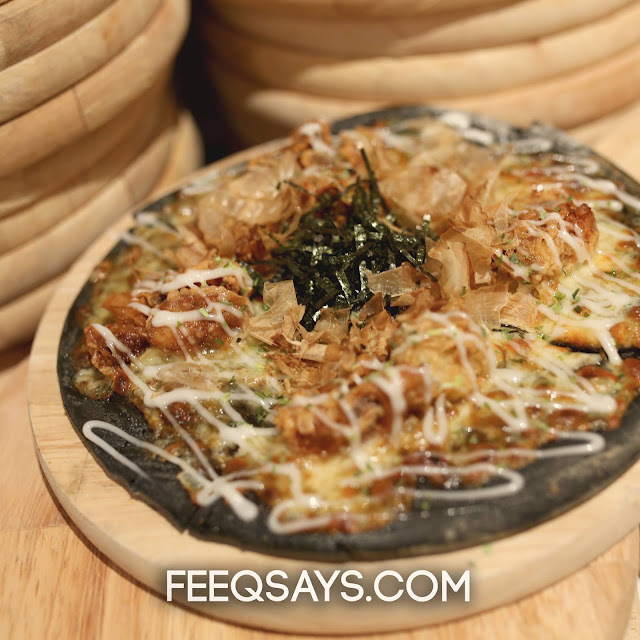 Charcoal crust, teriyaki sauce, mozzarella cheese, soft shell crabs, bonito flakes, shredded seaweed and Japanese mayo. 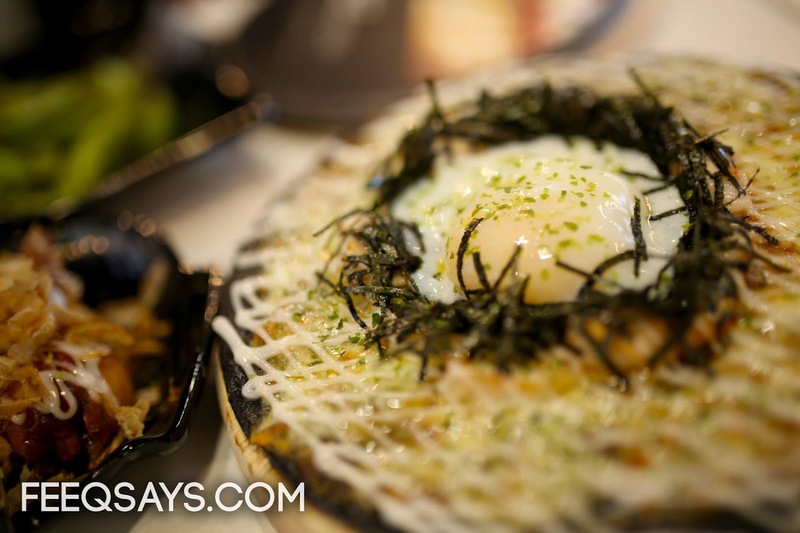 Charcoal crust, Japanese curry, teriyaki sauce, mozarella cheese, soft shell crab, extra cheese, onsen tamago, mentai mayo and shredded seaweed. Another one that I like is this one with Japanese curry and teriyaki sauce (it's a half and half pizza). I was the most skeptical of the Japanese curry sauce because I can't really think of curry as a part of pizza flavour but it was nice. The pizza was especially savoury with the cheese and onsen tamago together with the creamy curry, and a bit of sweetness added with the mentai mayo. A definite thumbs up to the soft shell crab because as you can see from my own pizza, I just love soft shell crab. Herb crust, Japanese curry, Mozzarella cheese, extra cheese, shredded seaweed, pineapple and grilled chicken. 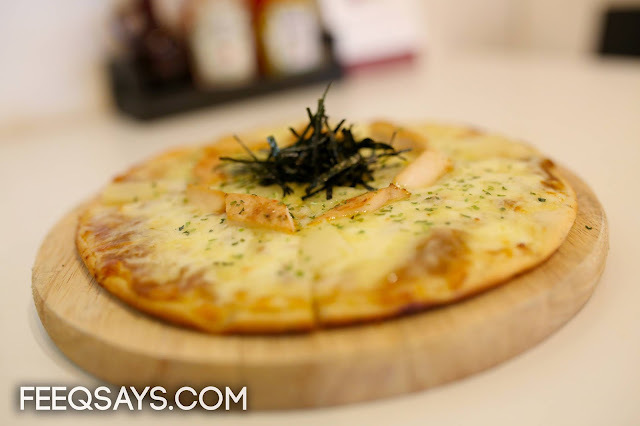 A more classic twist on this one, this pizza is like the Japanese version of the crowds favourite Hawaiian Chicken pizza. We all know already know that in pizzas, chicken and pineapple slices goes well together like bread and butter. For this one, the Japanese curry adds depth and new dimension to the flavour. It''s like discovering another side of what I thought a familiar taste. 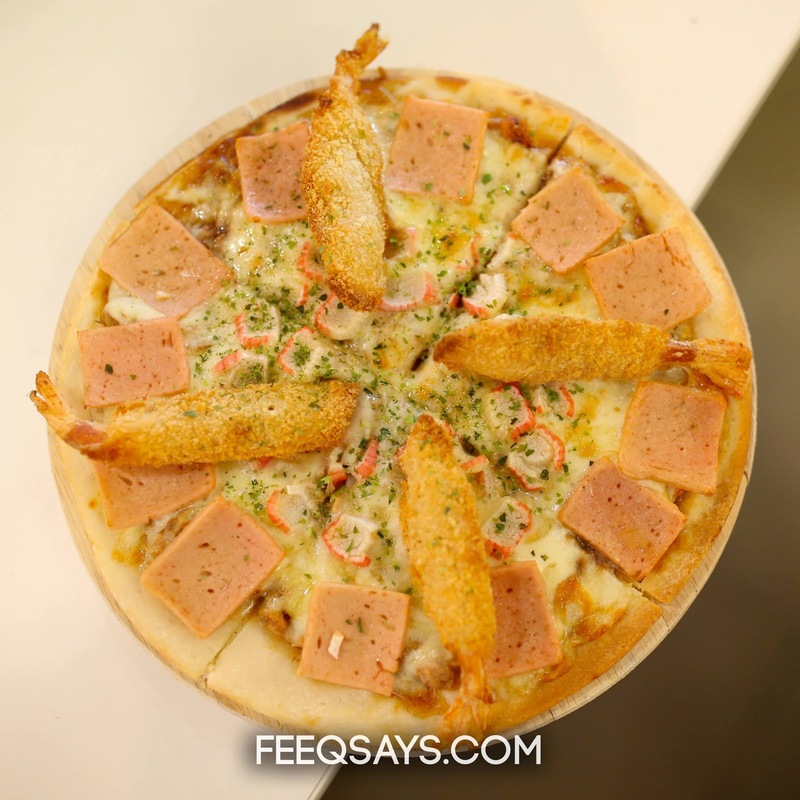 Plain crust, Teriyaki Sauce, Mozzarella cheese, Ebi Katsu, chicken ham, tuna, crab stick and extra cheese. This one was not bad but it does not strike as memorable to me either. There was too much going on in one slice. Its best to choose only one main protein (prawn, chicken or tuna) when you customize your pizza because the pizza size is not that big. You don't want strong flavours to overpower the sauce because it's one of the main contributor to the uniqueness of the pizza there. Herb crust, Japanese curry, wasabi mayo, Mozzarella cheese, beef pepperoni, extra cheese and shredded seaweed. Last but not least this pizza which reminds me of my favourite pepperoni and cheese pizza. I've got to say that the Japanese curry and wasabi mayo sauce brought a whole new definition to something that's so familiar to my taste bud (again, this one is also a half and a half pizza); but not in a bad way. Its actually kind of nice to have that extra 'kick' in what usually a very cheesy and savoury kind of pizza. I don't know if its the thin crust but the pizza taste kind of lighter with the curry (in term of greasiness compared to normal pepperoni and cheese pizza). In term of portions, among all six pizzas we had, I think its the only one that I might be able to finish on my own.Despite that small size, the pizzas there are so full filing. 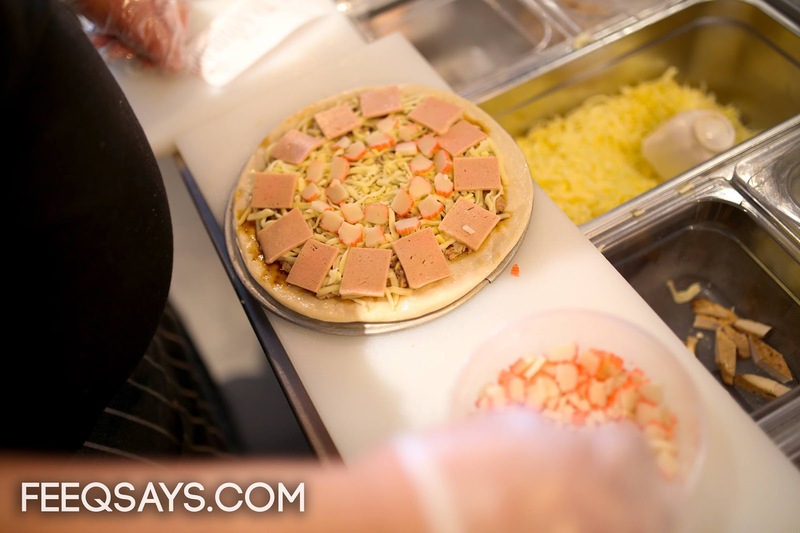 For the customized pizza, the price varies depending on the type of toppings your choose. On average, basing on the one we customized the price turned out to be quite affordable. I would definitely come back if I got the chance to. I would like to thank Feeq for letting me use his pictures for this post. This airhead here forgot to bring the camera memory card so all she did that day was truly enjoying the food. LOL.For more information on Raku Pizza, you can check out their Facebook Page at Raku Pizza 楽ピザ or call 03-56312188 for any inquiries. I agree on that Fish. Luckily I took Uber there that day so I was spared from the torture. I love to try the Raku Pizza as we can choose our own toppings and sauces. 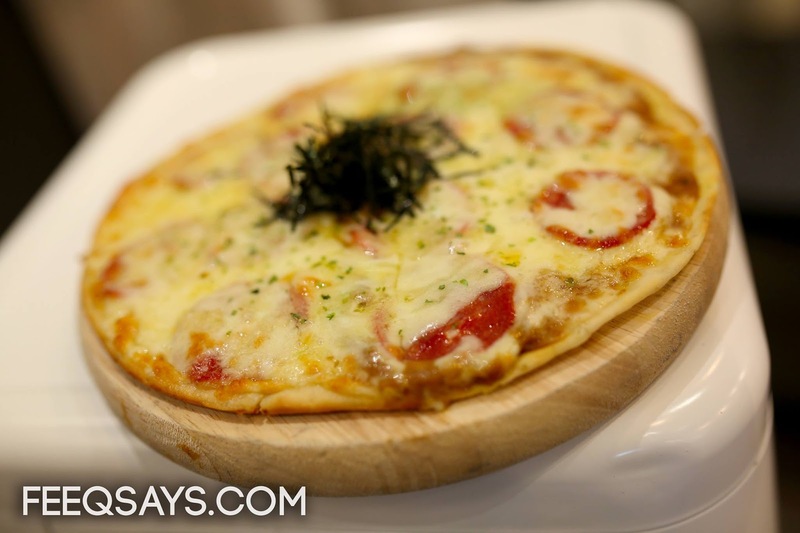 I've not tried Japanese pizza before even though I do frequent Japanese restaurants. Next time I will order pizza. cant imagine tat when japanese match with italian pizza.